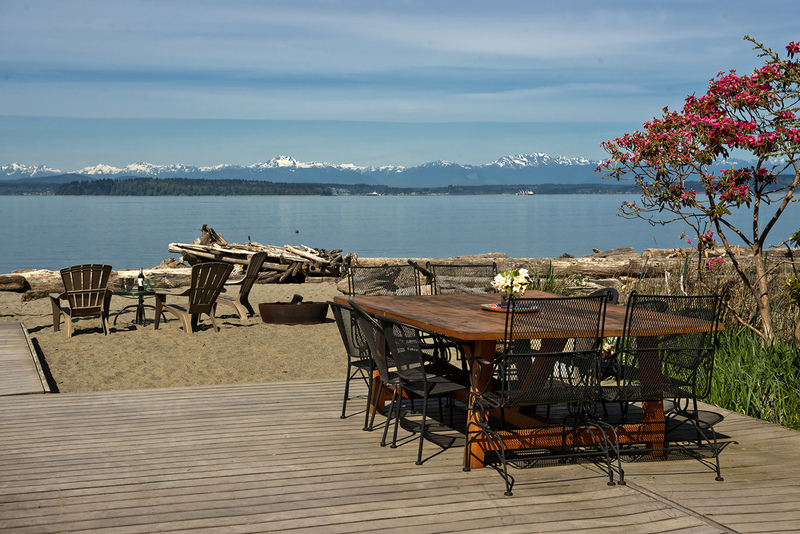 Built as the first personal residence by renowned architect, George Suyama, this beach retreat is commonly known as Fauntleroy 1. Steps to the no bank waterfront just north of the Vashon ferry dock, the Zen design is evocative of Suyama's Japanese heritage and the inspiration of his mentor, Gene Zema. Lush use of wood, metal and organic materials, the timeless design frames west facing vistas of Puget Sound and the Olympic Mountain peaks. A sense of calm and serenity belies the proximity to downtown Seattle--close by but a world away. 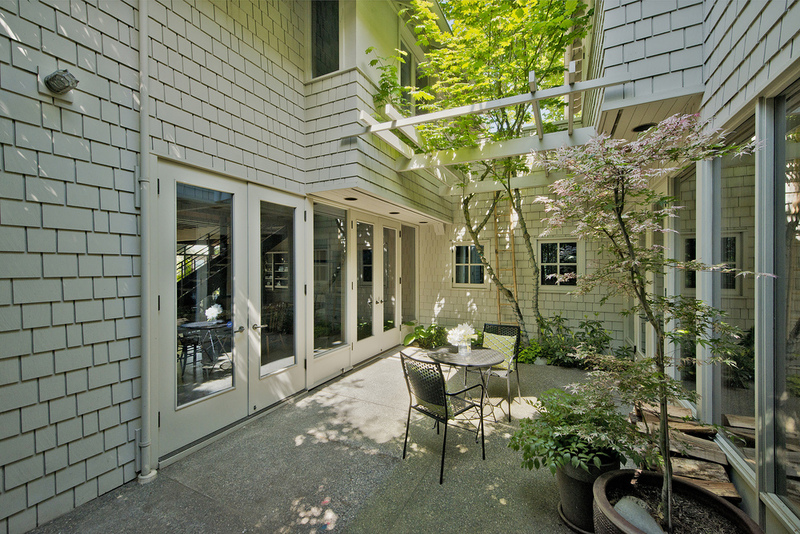 Entry to Fauntleroy I is through a gated, enclosed COURTYARD off the garage that eases the transition from public to private space. A wide glass door opens into a hallway that leads past a wall of sliding panels that evoke the style and functionality of Shoji screens and leads straight ahead to the master bedroom and to the left for access to the bathroom and second bedroom. On this same level, the MASTER BEDROOM is accessed via a corridor of custom built-ins providing ample storage and a modicum of privacy screening. 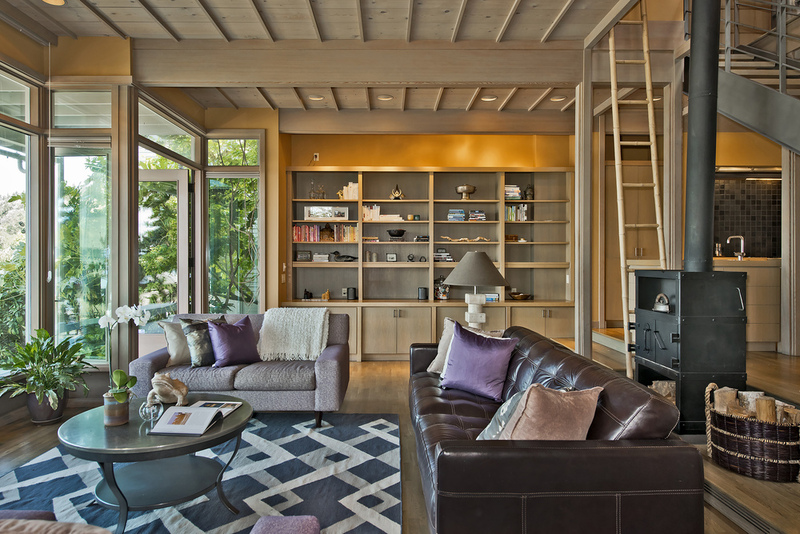 This room functions as the central module of the house, and frames its most iconic and spectacular views over Puget Sound and daily Fauntleroy ferry traffic. The sleeping area is centered on a raised platform to take full advantage of this outlook, and the entry corridor is matched on the other side by identical built-ins and closets. A hewn, naturally arched log forms the central structural arch above the bed and helps focus attention on the double row of windows. All overhead surfaces are sheathed in pickled clear vertical grain fir with narrow strapping that evokes the texture of a tatami mat. A built-in headboard provides both bedside lighting and storage. The main UPPER LEVEL BATHROOM is a sensuous retreat that suggests a traditional Japanese bathhouse with dark tile surfaces, a massive granite counter, elegantly simple custom woodwork and cabinetry, and the playful use of exposed structure. A custom-built soaking tub anchors the room, protected under a removable cedar door, and sheltered beneath a small roof structure. Cabinets are custom-built of rift-sawn oak, and leaded clerestory windows open the room to light from a central skylight. A spacious walk-in shower and lavatory share a private area off the main bathroom. A SECOND BEDROOM off the entry hall is ideal for use as a home office or children’s room, and the entire second level is arranged around a light shaft that extends from the roof down to the lower level. 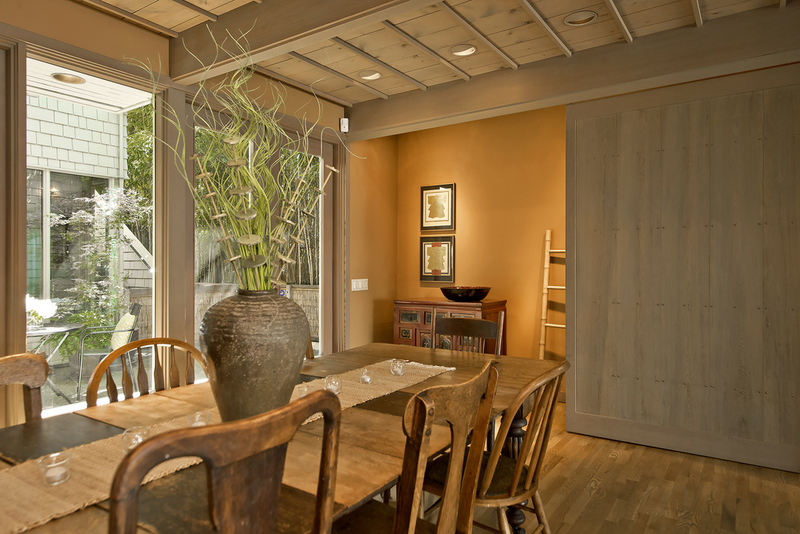 All rooms share ceilings and upper walls that are constructed from fir plank with delicate cross strapping. Floors are oak hardwood. A beautiful steel and wood staircase lead to the main public level of the house, terminating on the lower level at a floor-to-ceiling window that frames a patch of bamboo. This strong central element helps define the living and dining areas, and sets a tone of symmetry that is used throughout the house. The primary LIVING ROOM is sunken from the rest of the main floor, and centers on a set of symmetrical windows with two sets of French doors, one on each end, that lead out to a series of beachside decks and patios. The North wall contains custom built-in shelves and cabinets for storage and display, while the South end of the room features a pair of large sliding doors that function as virtual walls to help define and enclose recessed spaces. The area is flooded with natural light and dramatic water views, yet maintains a cossetting level of comfort and privacy as a result of its enclosing North and South walls, natural materials and tranquil colors and textures. The chef’s KITCHEN is a high-performance space for cooking and entertaining, centered around a long, built-in table that divides it from the dining room, and featuring a full-length cooking alcove that contains a custom made commercial hood, Thermador grill and six-burner Wolf cooktop. A sliding door leads to an additional PREPARATION AREA in which a commercial-style SubZero refrigerator, dual Dacor wall ovens, a warming drawer, and a Bosch dishwasher can be found, all set into matched custom cabinets with Corian work surfaces and a large kitchen sink. The cabinetry is a wonder in its own right, resembling fine modern furniture and crafted from rift-sawn oak. Set back from the main public areas of the beach level, a deep central courtyard is defined by the main house and its associated garage, and provides a delightfully sheltered and private space for outdoor enjoyment that is easily accessed by two sets of French doors in the dining area, and screened from the neighbor by a mature stand of bamboo. 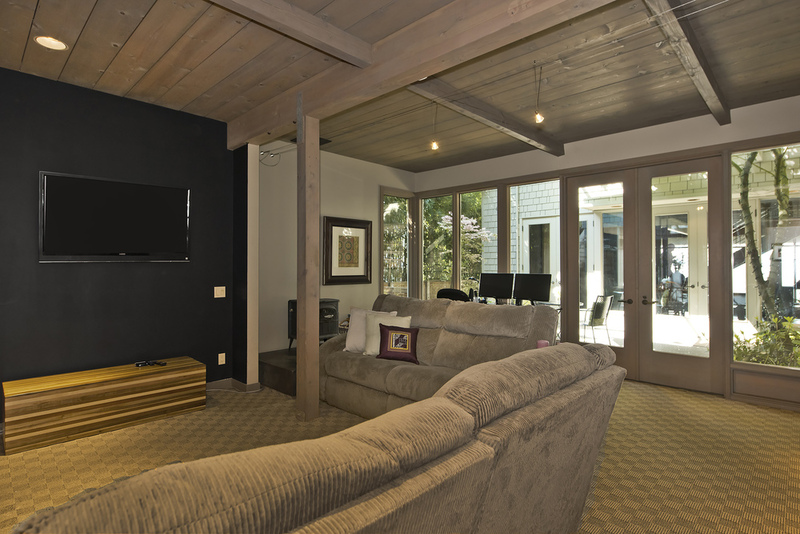 The rear section of the beach level contains a THIRD BEDROOM, as well as a spacious DEN & OFFICE area that includes a hidden Murphy bed for guests. This area addresses the main house from across the courtyard, and continues its exposed structure and wood-clad ceilings. The room opens into a secondary FULL BATH with natural elements that resemble those found in the upper level. Hewn branches are set into the exposed wooden structure, and a sliding Shoji screen covers the linen closet. One-inch tile is used for the floor and shower surround. There is a small POWDER ROOM off of the service kitchen. 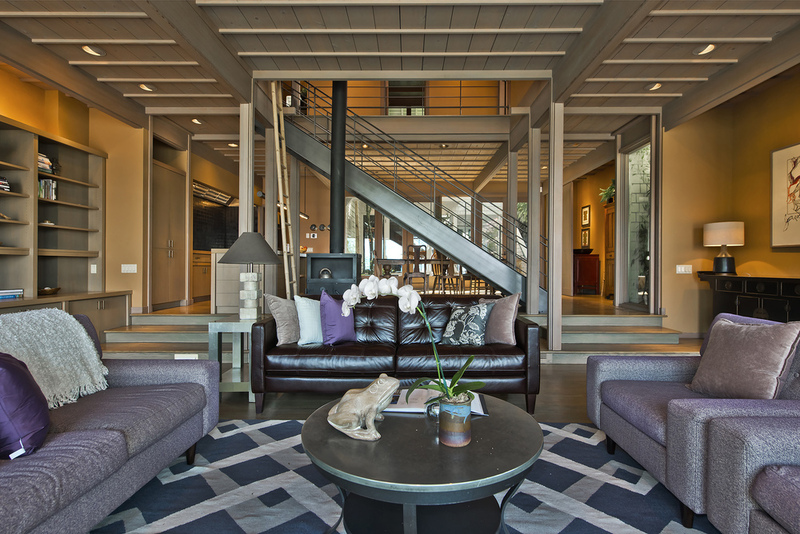 To the left is a large utility area that has been transformed into a comfortable third bedroom, while maintaining the material integrity of its dramatic board-formed concrete foundation wall. This room opens into the side yard for easy beach access. 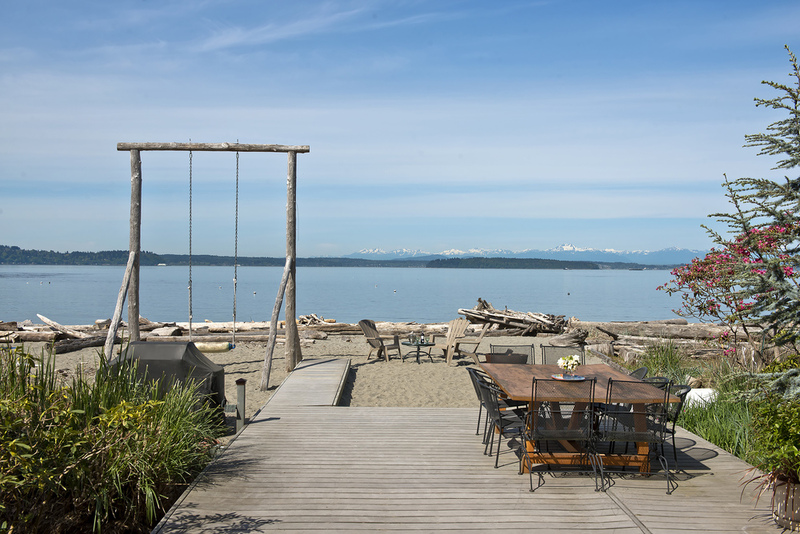 Fauntleroy I is ideally situated directly on the beach, just off of Fauntleroy Way and within a block of the ferry terminal. White sands and large chunks of driftwood define this lovely waterside community, which shares a swing, play areas and a volleyball court for regular outdoor recreation. The house offers a loosely places series of decks that project toward the water and afford numerous opportunities to sit in the sun, meet with friends or enjoy dinner al fresco. Shipping and ferry traffic provides constant water-born sites, while the beach itself is a year-round natural joy. The Fauntleroy neighborhood is well situated to afford easy access to downtown Seattle, all that West Seattle’s neighborhoods have to offer, and to the entire Eastside and Seattle tech corridor via I-5 and I-90. An opportunity to own such a pivotal and iconic masterpiece of an architect’s career rarely materializes, but finding such an intact and utterly livable, timelessly up-to-date residence is almost impossible. Fauntleroy I encompasses all of the elements that have made George Suyama such an internationally renowned and sought-after architect and presents them in a singular and pedigreed residence that is set in one of the region’s most naturally beautiful communities. George Suyama is one of the living legends of the Northwest modern architectural movement. His aesthetic is one of continued refinement and simplification, with materials and structures pared down to their most essential elements in pursuit of a design ideal that seeks to create spaces of profound atmosphere and human-scale harmony. Suyama studied at the University of Washington School of Architecture, receiving his Masters degree in 1967. Following that, he worked with Gene Zema and Ralph Anderson until forming his own practice in 1971. These proved to be formative experiences for the young architect, as they afforded him the opportunity to study building and design in Japan with Gene Zema, and to work alongside Ralph Anderson, one of the area’s most respected and prolific residential architects, and a defining figure of Northwest modernism. Throughout his practice, Suyama has adhered to a rigorous process of stripping designs to their most elemental forms and emphasizing craftsmanship and material integrity to yield projects of singular refinement and serenity. This disciplined approach to creatively satisfying client needs has earned him a devoted following, as well as numerous high-profile commissions, local and national honors and awards and inclusion in a wide range of publications. George Suyama is a member of the AIA College of Fellows and received an AIA/Seattle Medal of Honor for his contributions to the profession.